In addition to character specific props, I created several more custom props for Bryson Springs such that once again I was barely able to make it to my game in one trip with all the boxes I was lugging around. I just can’t seem to help myself these days, for some reason horror games don’t feel complete unless I’m handing out several physical props. 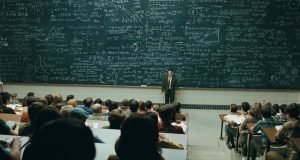 Bryson Springs made it easy as the text specifically describes several physical clues which are just begging to be made real. First off is this briefcase, the creation of which I posted about a while back. Sadly the paint when dried looks a bit duller and less like blood than when it was wet, but it still looks pretty good. I think the set up for this prop in the text is great — the players first encounter a room splattered with blood but one surprisingly clean rectangular space on the floor. Delivering a blood splattered briefcase to them gives them all that delightful “aha” moment. The let down is that the means of delivery just lays plain all the facts (whose it was, how it got there, etc.) I think it would be nice if the connection of the blood splatter was itself an additional clue. 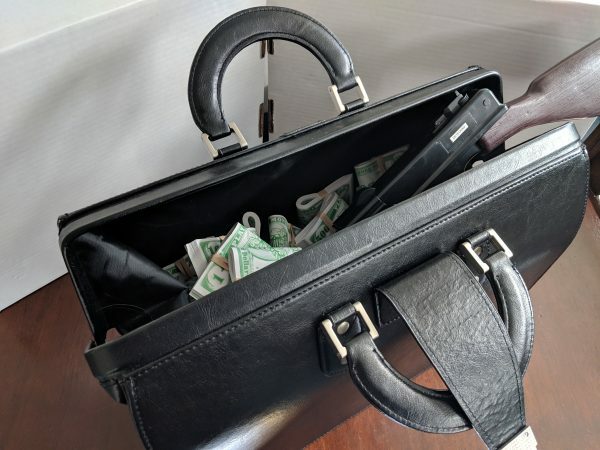 I was surprised at how difficult it was to find an old beat-up briefcase. I scoured a couple different sources, but all I could find was newer feeling laptop cases. I guess brief cases are just passé enough that they’re not even in second hand stores anymore — all I could find there was more modern soft-shell laptop bags. 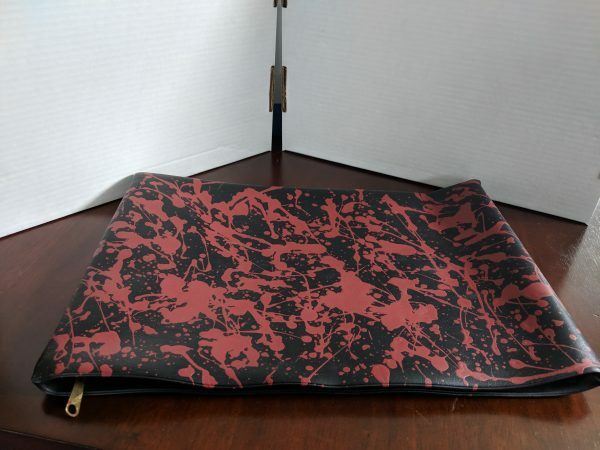 This one isn’t even really a briefcase, I found it on eBay described as a “document holder” and it’s just a rectangle of faux-leather material with a zipper top. But the price was right and it works well enough in practice. The real pay-off of this prop is the other props it contains. But before we get to the briefcase contents, there’s the book. The victim was attempting to translate some horrifying Cthulhu-writing from what the text describes as a jade-handled Chinese scroll. I hunted around online for something appropriate but wasn’t finding anything I liked. 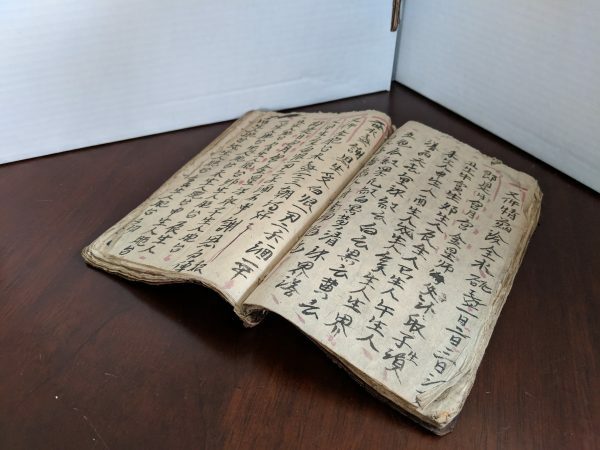 Then I stumbled on this Etsy shop that sells vintage Vietnamese “Yao books”, which are both gorgeous and ancient looking. I snapped one up. 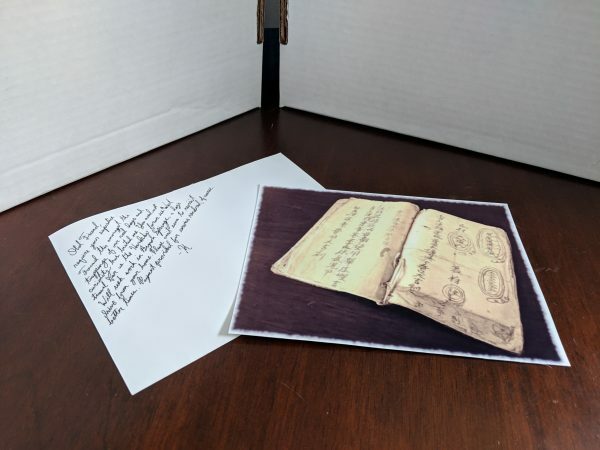 The briefcase is supposed to contain a picture of the scroll with a message written on the back. So I took a photo of my book, then applied some “old timey” filters and printed it out. I added the hand-written note to the back described by the text. It’s nice that this prop comes fairly early, as it really feels impactful when I pull out the actual book at the end. The briefcase also contains the owner’s translation notes, and I found online another GM who created props for this game which included a physical version of them. 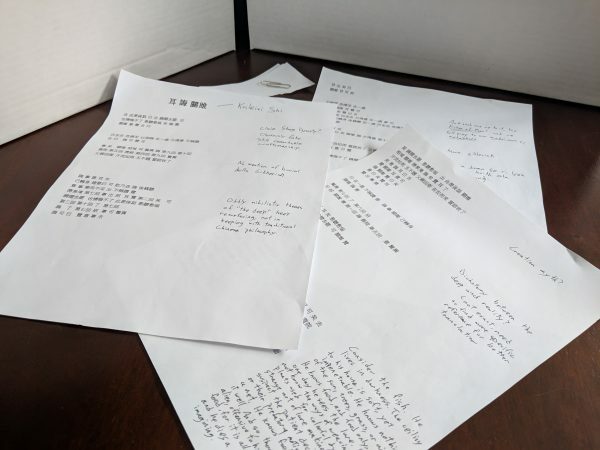 He also expanded on the notes and I liked what he did so I stole it wholesale. I didn’t bother with aging the notes, but I did also include some torn-off pages paper-clipped to them for added effect. The only down-side to these props is that the players who found them in both cases simply read them to themselves and then put them away. I think it would be much more enjoyable if the player read the notes aloud to the table, but my characters have enough distrust built into them that perhaps it feels a bit counter to their in-game motivations. Also I have yet to see anyone read the really dangerous part out loud, which is a bit disappointing. But I only have two data points so far, so perhaps the next run will see something different. 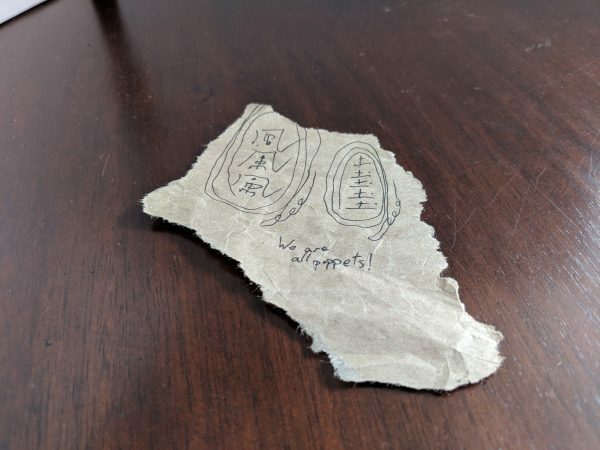 This little prop is a scrap of paper clutched in the hand of the corpse, should the players investigate in that direction. It simply ties the corpse back to the briefcase and book, but I also like that it’s a way for a split group to discover similar information. For this I just grabbed some brown packing paper and tried my best to copy some interesting glyphs from my book and then add in the creepy English note. For my last prop there’s this beauty, which I posted a pretty terrible video of from the convention (terrible because the wifi of the hotel was awful so the video quality is quite poor). This bag of cash and tommy gun has nothing to do with the text of the game whatsoever. This came from watching the movie “Oh Brother Where Art Thou”, There’s a scene where the protagonists meet up with “Baby Face” Nelson, and he has a similar bag in his car. I think I was also drawing from the actual play recording where the player of the criminal invents a tommy gun in a violin case in the FBI agent’s trunk as an excuse to rejoin the group when he could have otherwise escaped. Side note — good on that player for doing this, I wish more players would take it on themselves to invent reasons to stay in the game. Anyway, I decided to include this to have a prepared draw for that player to not simply cut and run, and it works as desired. I don’t say explicitly what’s in the trunk, just “valuable seized evidence”. The funny bit that I tried explaining in the video is that this prop is quite bulky, and I’d like it to be out of eye shot until a player actually opens up the trunk. To do this at the convention I ended up sliding it under the table before anyone showed up. In both games I ran, when a player finally went to open the trunk, I told them “the contents of the trunk are under this table, please reach under there and get them.” This never failed to surprise and delight the players. Another unforeseen benefit of this prop is that the value of the cash is a sharp contrast to the generally destitute state of pretty much everything in Bryson Springs. By the time it emerges several players are well on the road to madness, and have done crazy things with it. In one game I had a mad Dorothea Lange gleefully toss piles of cash into the Hooverville in an attempt to “save them all.” It was pretty satisfying, and I like the idea of having a fun prop like this the players can use as they see fit rather than trying to interpret it as a clue to the mystery. And those are all my Bryson Springs props. I’m looking forward to running it again at least once more at HelgaCon in another couple of weeks. I have read people wondering at the point of convention games. The idea is that compared to a campaign with continuity of story and investment from players a convention game with no repercussions with a bunch of strangers just doesn’t cut it. I think the last post and this one, along with some of your other posts, show the strengths of convention games. You can put much more preparation into them than a campaign. You can invest more in props due to both the reduced frequency of running and reuse if you plan to run the session multiple times. You can get better over time through multiple runs, leading to a much tighter game. I am really impressed by the work you put in and think it would be a great experience being a player in one of your games. Both as GM and as a player I find I look for different things out of a convention game than a regular campaign. Certainly you hit the nail on the head in regards to what’s in it for the GM – the ability to put more care and thought into the material, to practice and refine the experience, etc. If you’re interested in publishing your material, it’s a great way to test your ideas first. As a player, convention games can really expand your horizons. You get to meet and play with new people, sure some of them may be terrible, but some may (and for me have) become life-long gaming friends. You get to try out new systems with lesser repercussions if it turns out to be not your thing. And you get to play your character “to the hilt”, not something many people are comfortable with in a campaign when they really care about their character’s progression. For my style of play, convention games are perfect for Cthulhu or any horror type game. As a player in those games I really want to explore how an ordinary character deals with facing existential dread – will they rise to the challenge (and likely die a heroic death), or fall apart in a downward spiral of madness? It’s hard to imagine such a game in a campaign, unless you go the heroic path sans death, but that I think really takes the teeth out of the experience. So that’s what I try to bring to the table GMing such games. I always open telling my players that my goal is to have each and every one of them go insane, die horribly, or both. If that sounds appealing to you, by all means come join my table. I expect to be at Carnage on the Mountain in Vermont next November. I think you guys are hitting on another good cardinal rule of play, similar to “Don’t keep secrets from your fellow party members.”, with the anecdote of the player who stayed to retrieve his tommy gun. Something to the tune of “Do not make or follow plot threads or role playing ideas that exclude or remove your character from the action.” This is a group activity, it’s up to you to make up a reason for your guy to stay with the group. The classic trope of “My character is a loner, and so I’m going on an adventure with this group of people.” is the prime example of swimming upstream from the overall goal of the game. We’ve all been guilty of it from time to time. I remember that catastrophic Deadlands game so long ago where the whole party wound up abandoning the town before the plot happened ‘cos we all roleplayed ourselves out of engaging with the scenario, and then half the group wound up trying to kill each other because of a perfect storm of clashing character motivations.